I know I am not going to be at my modest best when I make this post. Yes, it was 200kms, but no, it was not so much an achievement. Yes, it was tough, there were moments, but no, it was not tooouugghhh tough. Yes, it was a hot day, so? Yes, there were some uphills, so? I always believe we kid ourselves too much and build some strong mental boundaries around us. When you put these efforts in perspective, you know what I mean – a 200k is about when you start to warm up in a race like the RAAM where you ride some 5000kms in about 10days. Our own Samim qualified for the RAAM 2010, with the 701k in 24hrs! So what we did yesterday is about 10% of that effort. We talked about the RAAM a lot during the ride. You can read all about it here and follow Samim’s quest for a podium finish this year on his website here. I guess, it all comes down really to a quote that I wrote about in my Hyderabad marathon review, “it all depends on how badly you want to do it”. Venkat had done some serious hard-selling of Hessaraghatta as the most ideal place to ride in this world. He had picked this loop of 33km and we were to do it multiple times. On Saturday, I figured it was not so much of a loop, but a 17km out and back. And when I mentioned the soaring temperatures these days and quipped if there was any cover, I got an honest but discouraging “No, none at all”. The only thing I could bargain for, was the start time and my behest we started the ride at 5:20am. The route passed the Horticulture University and out at Nandini Sperm Station which was where we refueled after every lap. There were 2 wings – the left one was relatively flat towards Madhure, there were a couple of long uphills on the section towards Rajankunte. The roads were fantastic, with little traffic and perfect for a long road bike ride. Despite a ride-sabotaging puncture in the second loop (which cost us about 15mins), we were consistently over 25kmph. We were on target when we were done 110km by 10:15am or so. It was the much needed “Frankie” break. Venkat’s in-laws were fantastic, his father-in-law brought us “Frankies” (aka chapattis), his brother-in-law, Anil joined us for the first 4hrs on his bike. From there on, till we hit past the 140k mark, it was tough. We felt nearly every bit of the 37deg heat of Bangalore. I made an effort to keep myself hydrated – nearly 1-1.5 liter of water / electral / tang every loop of 33kms. And from my past experiences with cramps, I stayed off the cramps with constant massages. With cycling, unlike running, you do get the odd downhill where you can relax and give the thighs a gentle squeeze. I put my head down, the dividing line moving in slow motion, only the shadow of the feet moving front and back, and sweat dripping off from the helmet. We stuck to the job. The end phase was not easy either. 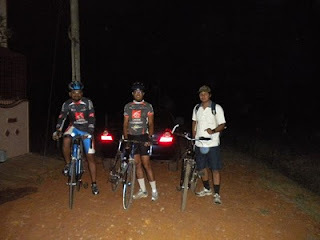 We shifted nearer home for the last 25km after a last break of Savige and curd at Venkat’s place we took off to finish the 200km. No endurance ride is complete in Hessarghatta till you ride towards Our Native Village – the red earth of the Bangalore Ultra. 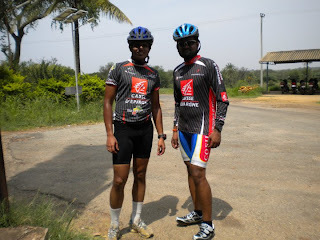 We rode, up the Bangalore Ultra route, to Taj Kuteeram. The shadows were getting longer once again but Venkat’s resolve was getting shorter. We changed course once again and decided to ride in short 2km loops for the last 15k or so. 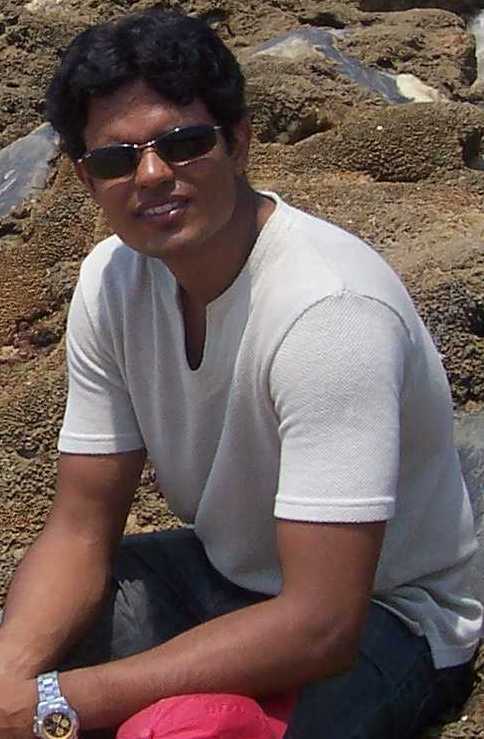 Venkat was great company and kept me entertained with all his goals for the year. It started with B2C1D (Bangalore to Chennai in 1Day) in the morning, by 10am he was chanting the RAAM mantra, by evening he had switched from cycling to running to get rid of his extra kilos! More important that those swaying goals, was the enthusiasm about everything he was saying, I am sure he would at least get to one of these soon. "We stuck to the job" - guess that says it all, doesn't it? Cool stuff macha. Was a good write-up. Congratulations, this is an awesome achievement. Congrats on your feat Guys!! Max speed of 37.5 kmph, not getting carried away on downhills takes amazing discipline. And 23 kmph is an awesome average speed for 200 km ..